The First Paradise is the natural one, from the time when we were inside the apple. Taking a bite out of the apple, we left nature and created the artificial paradise: the second paradise, which is currently devouring the apple. We are now entering the Third Paradise, integrating artificial life fully into natural life. It is the planetwide work of which we are all the authors. Michelangelo Pistoletto’s giant Apple Made Whole Again was installed at the center of Piazza del Duomo in Milan for the opening of the EXPO in May 2015. The work was dedicated by the FAI (Fondo Ambiente Italiano) to the fifth year of celebration of the VIA LATTEA, the “Milky Way” that comprises the entire agricultural hinterland of the Lombard capital, the largest in Italy. The steel structure of the Apple Made Whole Again was covered entirely with (natural) turf. Around it a large symbol of the Third Paradise was outlined with bales of straw, laid out during a performance by 300 people. Authorities of the UN, the city of Milan and the FAI took part in the opening ceremony. An agreement has been reached between Michelangelo Pistoletto, Cittadellarte, the FAI and representatives of the municipality of Milan for the donation of the Apple Made Whole Again to the city of Milan. Piazza Duca d’Aosta, in front of the Stazione Centrale, has been chosen as the appropriate location for its permanent installation. At the end of May, while waiting for its definitive location to be ready, the work was moved from Piazza del Duomo to the Parco Sempione and covered temporarily with textile material. Now that the technical and administrative procedures have reached their conclusion, we are coming to the moment of the installation of the Apple Made Whole Again in Piazza Duca d’Aosta. The sculpture will be officially unveiled on March 21, 2016, following a month of work in which the metal structure of the Apple will be reassembled and then covered with a layer of clay that will give it the appearance of marble. In relation to the artistic and social significance of this work, Cittadellarte-Fondazione Pistoletto will organize, on the two days preceding the unveiling of the sculpture, a forum entitled "2nd Rebirth Forum – The Apple Made Whole Again" that will be held on the premises of the Museo Nazionale della Scienza e della Tecnologia Leonardo da Vinci in Milan. Along with some Italian ambassadors of the Third Paradise-Rebirth, the participants in the forum will include representatives of public institutions, university professors and researchers, teachers and members of civil society associations and other entities engaged in practices of responsible and sustainable innovation in a range of spheres, from agriculture to health, from technology to economics, from manufacturing to politics, from architecture to fashion. The forum will mark the beginning of a series of activities in Milan that are going to last for a year. Their objective is to draw attention to the meanings of the Apple Made Whole Again and, in relation to them, contribute to the further development of practices aimed at bringing about change in society that are already under way in the region: this will be done in conjunction with the Museo Nazionale della Scienza e della Tecnologia Leonardo da Vinci and the activities that Cittadellarte, with Rebirth and its embassies, is carrying out in the world, in cooperation with the United Nations. The Milan Forum – The Apple Made Whole Again follows the 1st Rebirth Forum—Geografías de la Transformación that was held in November 2015 in Havana, Cuba, where the local Rebirth Embassy – Galleria Continua is coordinating a series of activities corresponding to the ones that will be carried out in Milan. The 1st Rebirth Forum, entitled Geografias de la Transformación, was held in Cuba from November 24 to 26, 2015. The previous year, on December 16, 2014, the symbol of Rebirth – Third Paradise had been outlined on the sea off the coast of Cuba by the Cuban Rebirth Embassy – Galleria Continua. The following day, December 17, the agreement between the president of the USA Barak Obama and the president of Cuba Raul Castro on a resumption of diplomatic relations between the two countries was announced. This coincidence of events has made clear the congruence between the Symbol of Rebirth and the emergence of new geopolitical scenarios, affecting not just the two countries directly involved but also the rest of the world. For sixty years Cuba attracted the world’s attention as a hotspot and mirror of a social, economic, political and cultural conflict that divided the planet in what was known as the Cold War. Throughout that time the world was caught in the grip of opposing forces in a struggle whose underlying causes have evidently not yet been resolved. At a moment in which a resumption of relations with the United States is taking place, Cuba assumes a central position on the world stage because of the way in which the situation might evolve. There is an urgent need to develop a completely new balance that will take the place of the previous opposition. The 1st Rebirth Forum was organized by Cittadellarte-Fondazione Pistoletto with the cooperation of the Cuban Rebirth Embassy – Galleria Continua, in synergy with the United Nations’ Agenda 2030 for Sustainable Development. At a cardinal point of the city, the square in front of the Stazione Centrale, Milan is hosting The Apple Made Whole Again, a work of art symbolic of an evolutionary transition that involves the whole of human society. Since this is not self-referential art, it is necessary to explain the meaning of this emblematic object that will greet people arriving in Milan and salute those leaving. It is a symbolic work that opens up to the world, just as the railroad station opens the city to the world, on a symbolic level as well. The purpose of the second Rebirth Forum is to convey to people a deep understanding of the symbolic message of this work and to get them to apply it in their everyday lives. The forum aims to spark off an active engagement of all sectors of society in the city of Milan in an effort to develop the concept of The Apple Made Whole Again and put it into effect. At the forum, therefore, the objectives proposed by this work will be discussed, questions will be raised on how to achieve them and activities will be suggested aimed at bringing about a real process of sustainable change in society. “The symbol of the apple runs through the whole of our history, starting out from the bite, which represents the detachment of the human race from nature and the origin of the artificial world. The Apple Made Whole Again represents the entry into a new era, in which artificial world and natural world are reunited, producing a balance in society that can be extended to a planetary dimension.” The symbol of the The Apple Made Whole Again represents the reassembling of opposing elements: nature and artifice. The apple signifies nature; the bite of the apple signifies artifice, just as we see it utilized in a world famous computer brand that has become an emblem of the way technology is taking over completely from nature. With the The Apple Made Whole Again artifice takes on the task of reinstating the part removed by the bite and reuniting humanity with nature, instead of continuing to widen the gulf between them. Rebirth places the faculty of creation peculiar to art at the disposal of this enterprise, fulcrum of a process that affects the whole of society; art, in fact, is at the root of every artifact, as the Latin term arti-ficium, something made from art, tells us. This is why the artist, with this symbol, assumes a fundamental responsibility in human society. Rebirth springs from Michelangelo Pistoletto’s two-decade-long experience with the Cittadellarte workshop of art and society, which combines the creative powers of art with science, technology, economics and politics and brings them to bear on every sector of our lives. At this workshop, Pistoletto has developed a formula of creation. This consists in the principle enunciated with the Theorem of Trinamics, which defines the very phenomenon of creation through the symbol of the triple circle. The triple circle also represents the synthesis between thesis and antithesis, and thus the equilibrium (the central circle) that emerges from the interaction of opposing forces (the two outer circles). Rebirth is the dynamics of the number three. It is the combination of two units that gives rise to a third distinct and new unit. The triple circle is a symbol of birth or rebirth, which takes place through the fortuitous or deliberate combination of two subjects, objects or concepts, like the positive and negative poles that produce electricity, like the male and female that generate a new person, like the fusion of oxygen and hydrogen that produce water and like the totalitarianism and anarchy between which democracy has developed. The 2nd Rebirth Forum has been organized by Cittadellarte with the participation of the Rebirth – Third Paradise Embassies and the public and private institutions that have been invited to join the initiative. The forum is being held under the auspices of the United Nations. The program consists of an initial exposition of the Rebirth project, followed by the intervention of the participants in sessions of debate and exchange of ideas. The agendas of the 17 Sustainable Development Goals of the United Nations and The Milan Charter form the main plank of the subjects that will be tackled in the discussion of the Seven Themes of Cittadellarte, to be regarded as the basis for a commitment to future development on the part of the participants. The work of the forum will be carried out utilizing the Trinamics method of research and application, which will be presented by Michelangelo Pistoletto and some members of Cittadellarte. The aim is: to bring about a genuine rebirth in the country through an assumption of responsibility for ourselves and for the world. This responsibility is founded on the search for a new cultural, political, economic and social equilibrium. In order to achieve this goal it will be necessary to start out from culture, and specifically from art understood as creative faculty. The themes cross interdisciplinary boundaries and cover a wide variety of sectors of interest, including: nutrition — genetics — medicine — education — philosophy — technology — scientific research — architecture — design — fashion — economics — politics — environment, landscape and agronomy — energy — entrepreneurship and handicrafts — art — religion. This second forum will mark the beginning in Milan of a Permanent Workshop on Art and Society, consisting of a series of activities that will involve the region, its associations, educational facilities, including schools and universities, public institutions, artists and ordinary citizens. As was the case in Cuba, it will be a workshop that, starting out from specific local characteristics and needs, will lead the various conflicting tendencies to find resolution in an effective equilibrium that society requires on a global scale. The 2nd Rebirth Forum – The Apple Made Whole Again will be held over two days of work and one final day of public presentation at the Museo Nazionale della Scienza e della Tecnologia Leonardo da Vinci. The program will begin with an official presentation, followed by an explanation by Michelangelo Pistoletto of the meaning and objectives of the Rebirth Forum – The Apple Made Whole Again. The forum will continue with sessions of discussion and exchange of ideas in thematic groups formed by all the participants. The document listing the Sustainable Development Goals of the United Nations and the Milan Charter, along with the Seven Themes proposed by Cittadellarte, constitute the main plank of the subjects that will be explored at the meeting. At the conclusion of the forum a document will be drawn up that will constitute the draft of the work program for the Rebirth Permanent Workshop, Milan. It is planned to follow up this meeting in Milan, after a after a year has passed, with a another forum to see what has come out of the workshop. From 4 pm to 6 pm the proceedings and conclusions of the forum will be presented jointly at the fair of conscious consumption and sustainable lifestyles entitled “Fa’ la cosa giusta”, FieraMilanoCity, pavilions 3 and 4, gate 4. At 2:30 pm on 21st March the official unveiling of The Apple Made Whole Again will take place in Piazza Duca d’Aosta. Cittadellarte-Fondazione Pistoletto is a workshop on a grand scale, a generator of creative energy that develops processes of responsible change in the sectors of culture, manufacturing, economics and politics. The activities of Cittadellarte pursue the basic objective of bringing artistic intervention on a practical level into every sector of civil society in order to contribute in a responsible and effective way to dealing with the profound upheavals of our time. 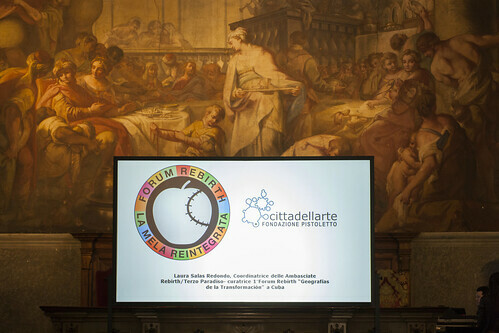 Cittadellarte works for a Responsible Transformation of Society. Pistoletto (Golden Lion for Lifetime Achievement at the 50th Venice Biennale and an honorary degree in Political Sciences from the University of Turin) founded Cittadellarte to place art at the center of human activities — economics, politics, culture, fashion, education — and to propose an environmentally sustainable development through an artistic approach. The symbol of the Third Paradise / REBIRTH, widely used in various contexts and numerous installations all over the world, represents the “rebirth” of society, a new world in which the “human community” is united, in which a dialogue between opposites is promoted in a quest for balance and harmony. Rebirth-day was founded on 21 December 2012 as a day on which to celebrate all over the world the symbol of the Third Paradise, conceived as a sign of the rebirth of human society. Rebirth is used as a term to indicate the activities and events that are organized under the sign of the Third Paradise. The Geographies of Transformation trace a new map of places driven by a commitment to responsible change in social systems. It is a cultural as well as physical geography, a network of networks of practices that have a great impact on all the different fields and disciplines. The Geographies of Transformation project maps this contemporary global movement in an archive that aims to be all-inclusive as far as the different disciplines are concerned. It is of primary importance to collect and classify the information obtained through such projects on the basis of particular criteria, in order to highlight its quantity and substance. The Geographies of Transformation also sets out to connect up the agents of this change through an online platform.